Fall Back in Love With Your Home! Do you look around your home and wonder when it lost its appeal? Have you thought back to when you bought your home and wonder where the nice house you bought went? 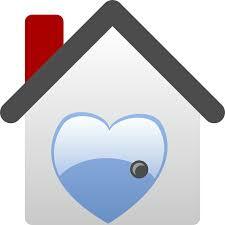 Well it is easy to get that feeling back, and fall back in love with your home! Here are some tips on how to be happy in your home. Rearrange your furniture. Move items to places you wouldn’t think they would look good, and keep it that way for a few days to see if you like it. It is amazing how much rearranging can change the outlook on your home. De-Clutter! When you first moved into your home, you probably only brought what you actually used. Now that you have lived here awhile you have probably acquired more things, and more clutter. Go through your home, and if you haven’t used it in the last 6 months, get rid of it! This could be a good time to have a yard sale and make some extra money, or to donate to those in need. Whichever you decide, the most important thing is getting the clutter out of your house! Fix the Small Stuff! Small stuff can be considered that one picture that never hangs straight, the clogged sink in the bathroom, or even a dingy outlet cover that bothers you. Fixing those small things will make a big impact. Clean and organize. Each month take one room to overhaul. It doesn’t have to be anything expensive, but go through that room and thoroughly clean it, organize it, and maybe even paint. Sprucing up the rooms in your home will make it more appealing to you. Paint your cabinets. Does your kitchen seem dreary? Is it something that you would like to change, but don’t have the money to get all new cabinets? Painting cabinets can be time consuming, but the end result is priceless. Get plants! Put plants and flowers in every room. This will brighten up your home and bring new life into every area. Add a little love. Do you have something you have been wanting to add to your home? Is there a piece of art that you just love? Or even something that you love that is sitting in a closet instead of on display? Splurge and buy the picture or move the item into your most frequented room so you can see it all the time. Your home is what you make it, and you can fall in love with your home all over again by focusing on what you loved when you bought it. When you are ready to buy or sell a home, we at Alain Pinel Realtors are here to help you with all of your real estate needs! If you are unsure what your options are, call Matt Tenczar at (408) 605-8124 or contact me via email. You can also visit us at our website for available listings and additional information.